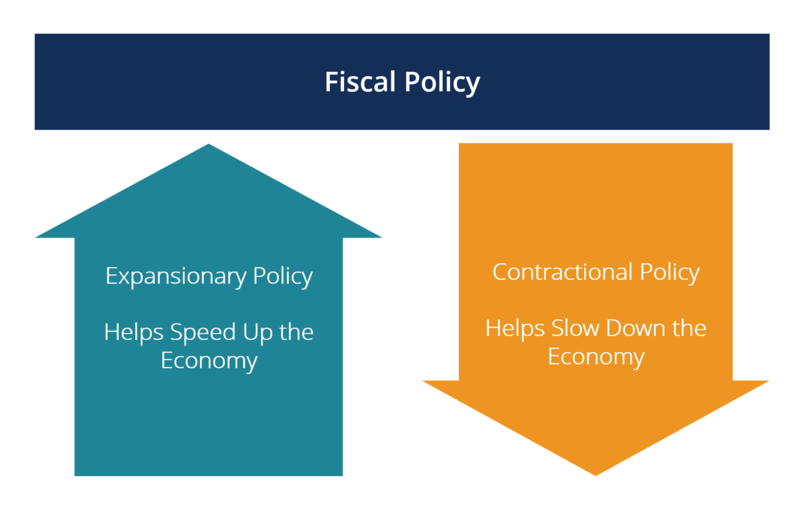 Fiscal Policy refers to the budgetary policy of the government, which involves the government manipulating its level of spending and tax ratesProgressive TaxProgressive Tax is one of the many ways of classifying taxes for a more straightforward analysis. Among the methods used are tax rates, which can either be Progressive, Regressive, Digressive or Proportional. The progressive tax system is one where the tax burden increases as the taxable income increases. In some within the economy. The government uses these two tools to monitor and influence the economy. 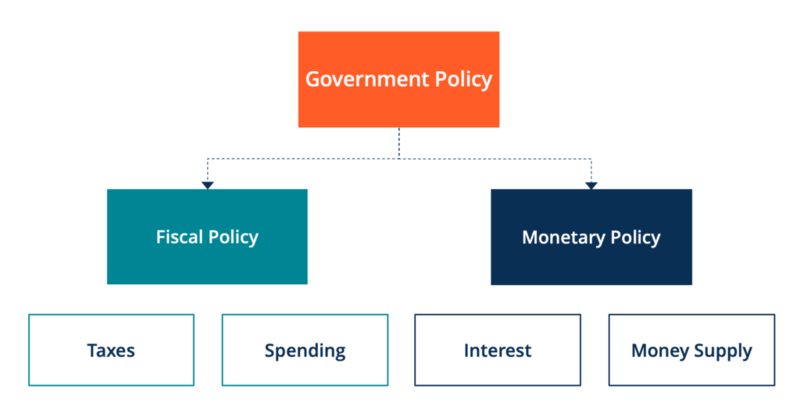 It is the sister strategy to monetary policyMonetary PolicyA monetary policy is an economic policy that manages the size and growth rate of the money supply in the economy. It is a powerful tool to regulate the. Although both fiscal policy and monetary policy are related to government revenuesSales RevenueSales revenue is the starting point of the income statement. Sales or revenue is the money earned from the company providing its goods or services, income and expendituresExpenditureAn expenditure represents a payment (either cash or credit) to purchase goods or services. An expenditure is recorded in a single point in time (the time of purchase), compared to an expense which is allocated or accrued over a period of time. This guide will review the different types of expenditures in accounting and both seek to correct situations of excess or deficient demand in the economy, they do so in very different ways. Before the Great DepressionThe Great DepressionThe Great Depression was a worldwide economic depression that took place from the late 1920s to the early 1930s. For decades debates have been going on abou, governments across the world followed the policy of Laissez-faire (or Let it be). This approach to the economy was based on the teachings of classical economists such as Adam Smith and Alfred Marshall. Classical economists believed in the power of the invisible hand of the market. They were of the opinion that the government should not interfere in the economy, as any interference in the market was uncalled for. However, the 1929 stock market crash that ushered in the Great Depression fundamentally changed the course of economic thought. The Depression resulted in low economic demand along with high unemployment. Classical economics could not provide any solution to the crisis. In 1936, British economist John Maynard Keynes published “The General Theory of Employment, Interest, and Money” (known simply as “The General Theory”). In it, Keynes called for an increase in government spending to combat the recessionary forces in the economy. He believed that an increase in government spending would bring about an increase in demand for commodities in the market. The Second World War provided empirical evidence of Keynes’ theory. Nations across the world increased government expenditure in order to build their armed forces. The rise in government expenditure saw a massive growth in employment and an increase in demandDemand CurveThe Demand Curve is a line that shows how many units of a good or service will be purchased at each possible price. The price is plotted on the vertical (Y) axis while the quantity is plotted on the horizontal (X) axis. Demand curves are used to determine the relationship between price and quantity for commodities in the market. In fact, the Second World War is often credited with bringing Europe out of the Great Depression. In times of economic contraction, such as the Great Depression in the 1920s and 1930s and the 2008-2009 financial crisis, the government engages in Expansionary Fiscal Policy. This involves a reduction in taxes and an increase in government spending. Both of these measures are meant to stimulate the economyMarket EconomyMarket economy definition - a pure market economy is an economic system where there are no regulations and players are free to trade as they please and increase the level of activity within the economy. During a recession, producers and consumers both lose faith in the market. Thus, consumers reduce consumption and producers cut production. As a result, the economy stagnates. If instead, the government faces a situation of high inflationInflationInflation is an economic concept that refers to increases in the price level of goods over a set period of time. The cause for inflation in the short and me characterized by excess demand in the market, it can engage in contractionary fiscal policy. For example, the government can impose new taxes and raise existing tax rates. This will reduce disposable income, which will cause consumption and investment to fall, thereby correcting the situation of excess demand. According to classical Keynesian economicsKeynesian Economic TheoryKeynesian Economic Theory is an economic school of though which broadly states that government intervention is needed to help economies emerge out of recess (derived directly from the General Theory), a reduction (or increase) in taxes and an increase (or reduction) in government spending affect the economy in similar ways. However, the government may choose to utilize one over the other for various reasons. For instance, raising taxes tend to make governments extremely unpopular. Hence, most governments, when faced with inflation and excess demand in the market, tend to lower government spending instead of raising taxes.